The basic difference between the two programs is that loan modifications are for people who have a financial hardship, and HARP is for sellers who don't qualify for a loan modification because they have no financial hardship. Your mortgage must be owned by Fannie Mae or Freddie Mac. Other types of loans do not qualify for HARP. You can look up your loan online to see if it is held by Fannie Mae or Freddie Mac by going to the loan lookup tools on the Making Home Affordable website. Your loan must have originated prior to June 1, 2009. Your loan-to-value ratio must exceed 80 percent. You must be current on your payments, with no more than one late payment in the past 12 months. Except for a small window that is excluded, you can't have used the HARP in the past. The main reasons a homeowner would apply for HARP arise when the homeowner wants to keep the home and cannot get a loan modification. Homeowners who would prefer to do a short sale generally do not apply for HARP. The refinance program has no limit on the amount of loan if your existing loan has a fixed rate. There is no cap. There is a small, limited, cash-out incentive. Generally, only closing costs can be added to your loan to increase its balance. You can remove a borrower from the existing loan if the remaining borrower can prove a steady payment history. This would work for a qualifying divorced couple. You can add a borrower to the loan, providing the new borrower can qualify. You can refinance if you've filed bankruptcy as long as the bankruptcy was discharged more than 12 months ago, and you've been staying current on your mortgage payment since. With the exception of one type of HARP program, a minimum credit score and debt ratio are not required. The same problem that plagues loan modification programs plagues HARP. For starters, not enough people qualify for the assistance, meaning the guidelines don't fit most people. The biggest problem is that the program does not reduce the principal balance. In fact, it makes the principal balance even bigger. You will continue to pay mortgage insurance if you owe it now. Although your payment might decline due to a lower interest rate, your payment might also go up, too. However, Fannie Mae guidelines state that if you did not have mortgage insurance before, you will not now. You cannot pay off or refinance a fixed-rate second loan or home equity loan through HARP. The best thing you can do is get the second lender to subordinate, meaning to remain in the second position. But there is little incentive for a second lender to agree. Why would a second lender want to jeopardize its position and sink into the well of no equity even further? You might change your type of loan to recourse. Laws vary by state. In California, for example, sellers who refinance are changing the terms of their loans from purchase money to hard money. Hard money can subject a borrower to a judgment in the event of default. Generally speaking, purchase money loans carry no recourse in California. If you were to go through foreclosure down the road, if your loans remained purchase money, you could be protected from personal liability in California. The fallout from a refinance, such as gaining the right to pursue a deficiency judgment in the event of default, can be a big plus for banks and a bad thing for homeowners. Under HARP, in two years, your home might still underwater and worth less than you owe. 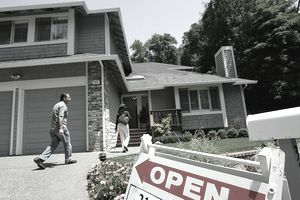 Sellers who arrange short sales can often qualify to buy a home in two to three years. So they essentially trade an underwater home for a home just like it but with a much smaller mortgage—except they rent for two years first. At the end of two years, a former short seller can have the same home but with equity.